Do you have a beautiful and luscious facial hair that deserves to be taken care of in the best way possible? Or maybe you wish you had such a glorious mane – and what you actually have is a scraggly beard that just doesn’t want to cooperate with you. Whatever the case may be, the beard oil is here to help. It can provide your facial hair with the necessary nutrients to grow strong and healthy, assisting you in grooming that thick mane you want to show off to the world. Beards are always trendy, or more specifically, good-looking facial hair is always trendy. Nobody wants to look like a man who hasn’t showered or even looked in the mirror for two weeks. However, well-kempt and properly groomed facial hair is the best fashion statement a man can do nowadays. For many men, growing a facial hair itself is a no-brainer. For others, the beard comes in patchy and is difficult to pull through, calling for a change in diet, skin care, and more. Whatever your relationship with your facial hair is, getting it to grow is only half the battle. The next step is making it look the way you want to. And that’s where beard oil comes in. This miracle product is basically a balanced diet for your facial hair. All the oils and nutrients your hair and follicles need to grow well are contained within the right oil, helping you to grow healthy facial hair, keep it well-moisturized and nourished, and tame it into a well-groomed mane. Whatever your style is, a quality beard oil will help you accomplish it. From a manly and rugged look to a classy and sophisticated style, or whatever you chose from the best beard styles, having good beard care products like beard oil is an essential part of the process. Not only in the morning when you’re making yourself presentable for the day, but all throughout the day – this product works to keep your facial hair healthy and well behaved. The best part about it is that it is easy to fit into your daily routine. A bottle of oil, regardless of which one you use, should last you for some time, and it’s easy to apply. Soon enough, you’ll get used to using it as a part of your daily grooming routine every morning and evening without a second thought. Whether your facial hair is in those beginning, scruffy and patchy stages, or if you have full-blown growth on your face, the best facial hair product will be helpful in every stage of your growing process. Why? Because it helps keep your hairs nourished, moisturized, and under control. Regardless of what stage your facial hair is in, if you have ever grown a beard, then you’re probably familiar with the itch that comes with it. Well, be prepared to forget what that is all together once you incorporate this substance into your daily routine! Itching and beardruff will become a thing of the past – as both of these are symptoms of dry skin under your facial hair, which becomes itchy and flaky as a result. You’ll also enjoy softer hair growth. Do you find that your facial hair itself is scraggly and brittle? This is because it is not getting enough nutritious oils from your hair follicles to allow it to grow soft and smooth. By applying this product to your skin every morning and evening, your facial hair will have access to the nutrients it needs to eliminate dryness, itchiness, and flakiness – leaving you with a soft, lush, thick, healthy beard. The reason this works is because the best beard oil will give much-needed moisture to your sebaceous glands. These glands are located at the root of every hair you have, and they supply your beard with the precious sebum oil it needs – which is basically liquid gold for your facial hair. Your sebaceous glands can only produce a limited amount of sebum oil each day, and that’s where this substance steps in as an all-natural supplement to your body’s natural sebum production. The answer to that question is found in the ingredients. Now, remember – not all facial hair care products are made equal. It’s important to find a high-quality product that agrees with your skin and facial hair to get the best results – and what that comes down to is precisely what makes up the substance itself. For best results, you don’t want to look at the packaging or the price. Some of the most expensive, beautifully packaged products can have bad outcomes, while some surprisingly affordable and minimalistic bottles can yield incredible results. What you really need to be paying attention to is the back of the bottle where the ingredients are listed. This botanical extract is one of the key ingredients that provide moisture to your hair follicles. It is loaded with vitamins and minerals and basically is to your facial hair what milk is to your bones. Is a triple treat in the facial hair care world. It is naturally high in vitamin E, so it helps in styling your mane, softening your hair, and hydrating your skin. This combination also helps in treating razor bumps and reducing the discomfort that you feel on your skin. Another thing that makes it great is the fact it’s not greasy or irritating, and the skin can absorb it quickly, so you’re not left with that greasy feeling. This is an ingredient you’ll see in genuinely premium products. It promotes a healthier skin tone and boosts potent antioxidants that help in decreasing the damage from free-roaming radicals and diminish the damage done by the sun’s dangerous rays. This substance is excellent for both coarse and fine facial hair alike. It aids in straightening and softening facial hair without leaving tangles and split ends in the process. It makes your skin feel and look healthier and – a big bonus for those looking for longer facial hair – it helps in stimulating facial hair growth. 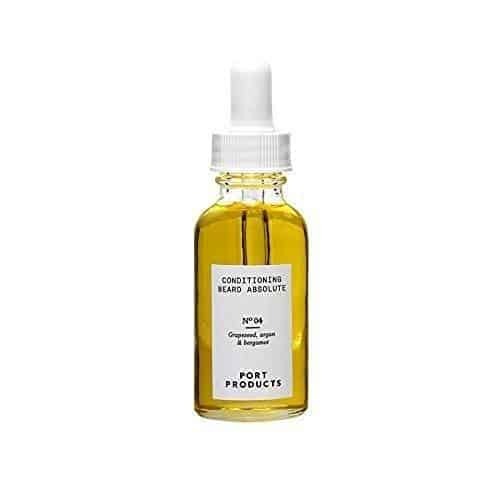 This is one of the best oil ingredients because it is able to quickly penetrate into the skin beneath your facial hair and alleviate wild, coarse, and dry facial hairs. This is one of the crucial ingredients that help in eliminating beardruff, controlling itching, and helping a beard grow faster. Vitamin E helps to prevent your skin from losing water and aids in retaining your body’s natural moisture. It can transform dull, dry skin into the well-moisturized, healthy, and glowing skin. Many of the best facial hair care products also contain essential oils. 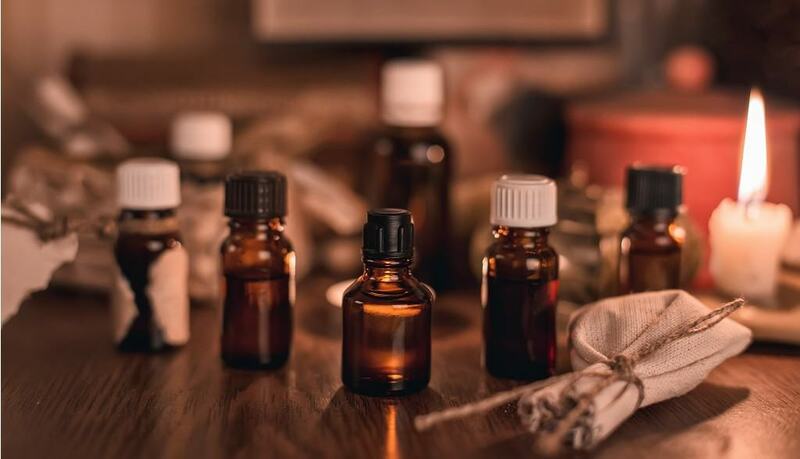 Different essential oils yield different benefits, and some that might be fantastic on one man’s skin and facial hair type might not do the same on someone else’s. 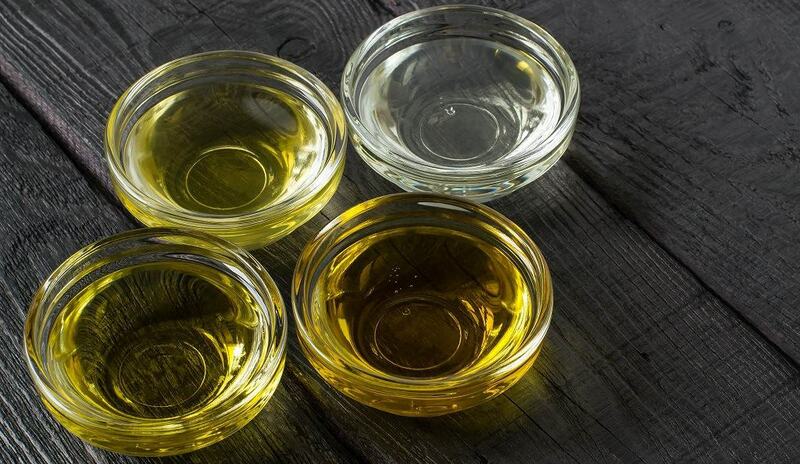 Knowing the oils that compliment your body, skin and facial hair the most is important. Made from the Eucalyptus plant, this is like the jack-of-all-trades in the facial hair care world. It is antibacterial, antifungal, antiviral, and anti-inflammatory – and it helps keep your skin tight. Tea tree oil works to heal and moisturize your skin. It repairs your damaged hairs as well, leaving facial hair shiny and smooth for hours afterward. It helps in reducing beardruff, itching, and redness while promoting all-around skin health. 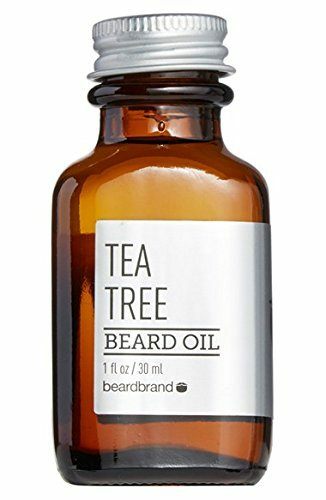 When it comes to beard softeners, you can’t beat the tea tree. Your skin will quickly soak it up, and become soft with none of that annoying greasy residue. Why not top off all of the nourishing and moisturizing benefits of the best beard oil with the delightful pinewood? It offers a distinctive but not overpowering pine-fresh scent along with pinewood’s natural healing properties. Fir needle is often added to facial hair care products, as it makes a useful astringent and immuno-stimulant. Helps to relieve itching, fight that stubborn acne that can crop up beneath your facial hairs, ease respiratory conditions, and is even anti-infectious and serves as an astringent. To top it all off, it also works effectively as an insect repellent – so if you’re growing a lumberjack beard, you can trust the bugs will stay away while you’re out in the wilderness! Sandalwood can help to relieve facial hair itch, and it also serves as an anti-inflammatory substance. Applying these products is extremely simple – which is good because it should soon become a part of your daily routine. After you wake up, simply hop in the shower and clean off your facial hair with a gentle scrub with your best beard soap or shampoo. After your shower, dry your facial hair thoroughly and pour your product into the palm of your hand. Remember, a little bit goes a long way, so you don’t want to use too much (more on this in a minute). Rub your hands together to spread the oil out on both hands. Then, gently massage into your beard. Start from the base of your hair follicles and work your way down to the tip of your facial hair. This makes sure that the majority of the oil is applied where you need it most – at the hair follicles and those sebaceous glands we talked about – while leaving just enough to moisturize and soften the ends. The amount of product that you’ll use in the application process depends on the size and length of your facial hair. A good rule of thumb (or, well, palm) is to apply about 3-4 drops into the center of your hand. However, if you are just starting to grow out your beard, 1-2 drops might do the trick – and if you are already the proud owner of a magnificent mane, then you might want to use 5-6 drops. 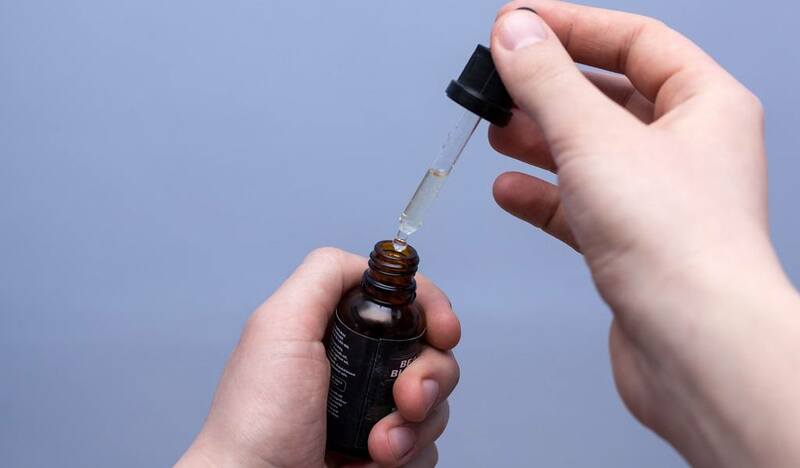 When a beard oil becomes a part of your daily routine, this will come naturally to you, and you’ll know exactly how much you need to apply in various stages of beard growth. Adjust the amount of oil you use as necessary. Believe it or not, the length of your beard isn’t the only factor that will determine the amount of the product you need to use. If the weather is colder in the winter months, your facial hair might suffer the consequences of the dryness. Applying a couple of extra drops of a facial hair oil can serve as additional protection. This will prevent your beard from becoming unkempt and frizzy, with split ends cropping up, and becoming wild and all around unmanageable. For best results, we recommend using this beard care product twice a day. This ensures that your facial hair enjoys in all the wonderful benefits that come with the most quality beard oil, keeping it well behaved, soft, and shiny at all times. The best times to apply this product tend to be once in the morning after the shower and once again right before you go to bed. This is because the hot water of the shower will make your pores wider and more readily able to absorb the oil throughout the day. Likewise, it’s good to apply it once again before going to bed because then you will give your beard enough time to soak up all the nutrients and experience all the benefits of beard oil. The scents contained in the beard oils are more of a passive sort of scents, and they are not meant to replace your cologne. This is nice in many cases because it means they are not too overbearing. After all, you don’t want to smell the strong scent of an overpowering substance right under your nose all day long, do you? While the scent of your product is usually subtle, it will last for a few hours after application. This helps to keep your facial hair smelling clean, fresh, and manly for many hours after you leave the house. You might be wondering, how do I apply this product? After all, if you are going to just pour the substance straight out of a bottle, it will be extremely difficult to control how much it comes out of it. Of these three types of applicators, we find the restrictor valve to be the easiest to use because it doesn’t involve as many moving parts. Simply tip it over and let a few drops fall onto your hands, massage it into your facial hair, and you’re good to go! They’re extremely clean and easy to handle, allowing you to get precisely the amount of product you need to be on your way in no time. 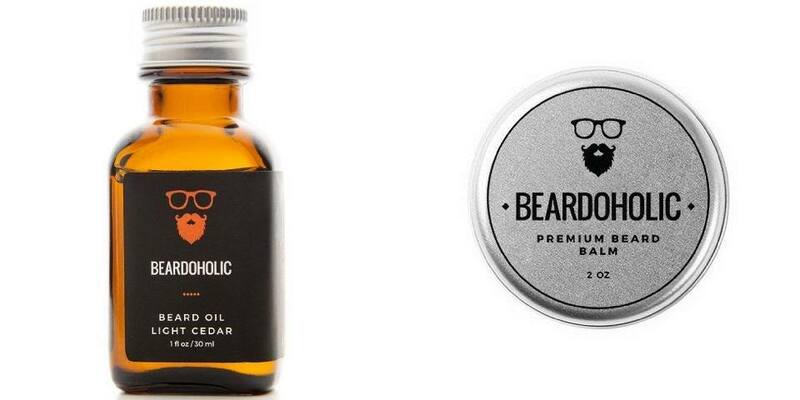 Believe it or not, the color of the bottle matters when it comes to beard oil. Because a darker colored bottle will ensure a longer shelf life of the product inside. 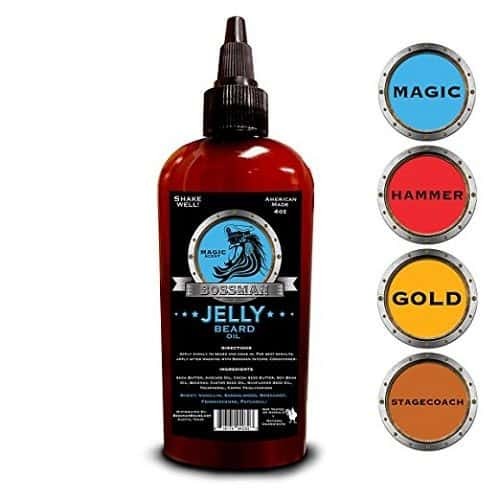 It turns out, those amber colored bottles are a sign that you are dealing with a truly premium product from a manufacturer that knows what they are doing. The reason this matters is because those dark and amber bottles help to ensure that UV emitting lights aren’t able to break down the delicate nature of the ingredients contained within. As you have likely learned by now, these types of products are intended to improve your overall beard health. It gives your beard the nutrients it needs, keeps it soft and moisturized, and makes it cooperative when the time for styling comes. However, it is not used only as a styling tool. Rather, it is a general facial hair care tool that you should use on a daily basis. On the other side, beard balm is a great styling tool – very similar to hair gel or hairspray. It can help keep your facial hair tamed and styled for extended periods throughout the day. A good balm will also function as a beard moisturizer and leave in conditioner, but it’s no substitute for a daily dose of beard oil. Long story short, both of these are great tools that every man should add to their facial hair care arsenal, just as important as beard trimming scissors and best beard trimmer for stubble. Beard oil is not a replacement for your usual styling tools like beard butters, balms, and waxes. However, it’s a great addition to any healthy facial hair care routine. You can simply apply your oil twice a day, and still, use all the other products when styling your facial hair. Thanks to the benefits that come from daily oil use, you might find that your other products last longer. You might not need as much balm, butter, or wax in the styling process thanks to the softer and more cooperative facial hair that comes with the use of beard oil. You might be considering trying unscented products because you don’t want an overwhelming, cologne-like smell right under your nose all day long. What’s important to remember is that even scented oils have very subtle scents that are far from overwhelming and only last for a few hours. Remember, the main ingredients in most of these products are the carrier oils – most of which are known for their neutral odors. The scent in your scented products comes from the essential oils – which increase the efficiency and benefits while adding a pleasant scent at the same time. Unscented oils are the same thing as the regular ones, but with the essential oils omitted. 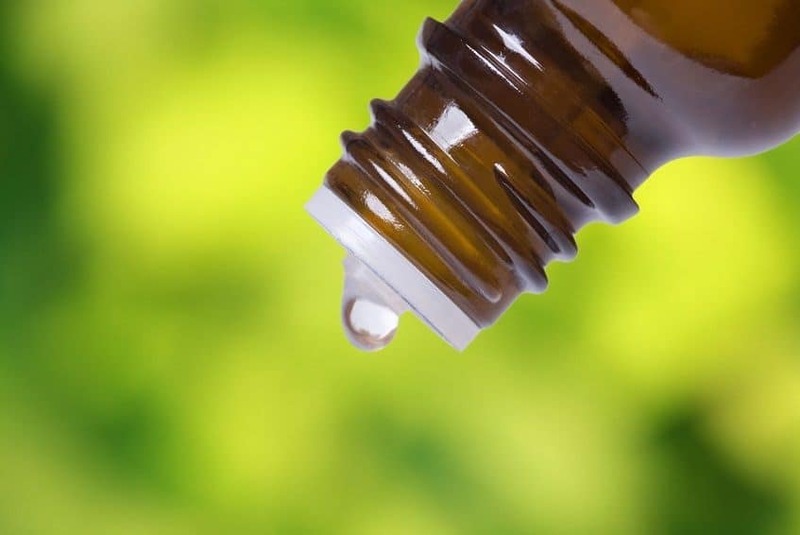 Remember, these essential oils are where the scents come from – but these ingredients also offer a lot of great healing, antibacterial, antifungal and antiviral properties, and so much more. If you opt for an unscented product, you are simply buying a product that is made up of carrier oils alone and compromising on a lot of the benefits that come from scented beard oils. This is why the best beard oil for some tends to be the scented one. However, there are a lot of guys that like to wear cologne and apply an oil at the same time. Also, there are some men who don’t want when their oil to have any scent. For both these groups of men, the unscented beard oil is a way to go. As you can see, it all comes down to personal preferences. 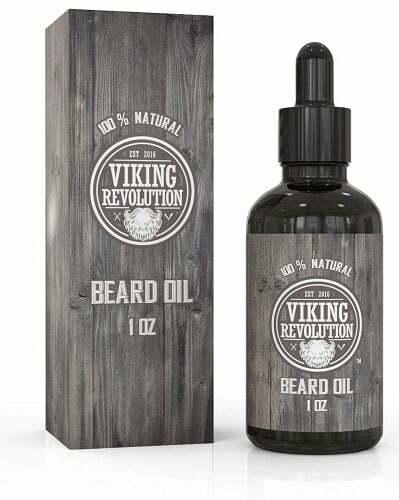 Effective in dealing with an itchy beard, Viking Revolution product is made with 100% natural, organic ingredients. Argan and jojoba oil are the two main ingredients of this product, both of which are known as great beard moisturizers and conditioners. 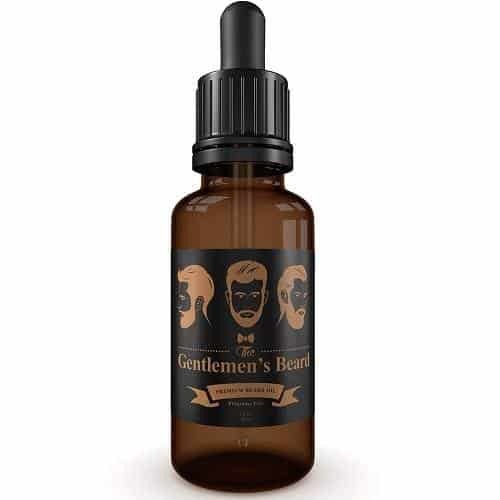 This facial hair oil is suitable for all beard types no matter the length and facial hair color. It is unscented, and therefore you can wear it alongside your cologne. The benefits you get are tamed, smooth, frizz-free and manageable beard. Just like when applying any other oil, don’t use more than a few drops if you don’t want to have that shiny, greasy feeling. When you apply this oil, you will instantly notice that it’s lighter and thinner than most other oils. In just a few uses, it will make your beard much softer than it was before. After using it for a few days, it will also help you eliminate beard dandruff. The bottle has the dropper cap for easier application because this way you can control how many drops of oil gets out of it. 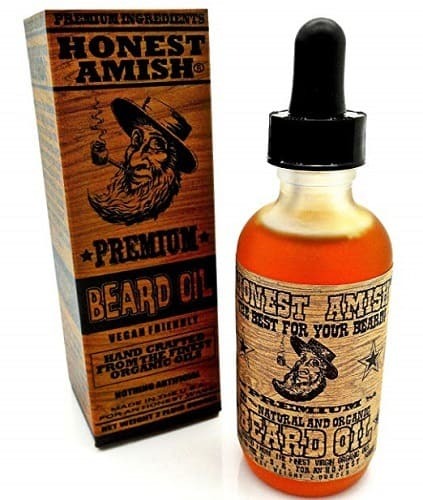 Almost every beardsman has once heard of Honest Amish Classic Beard Oil. 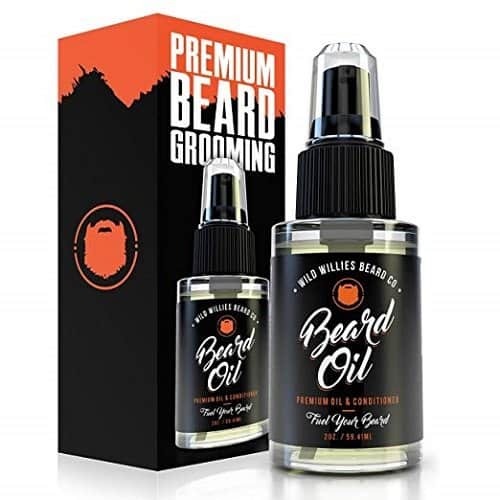 For those who haven’t, the first thing you need to know is that this item is made with 7 premium organic oils, as well as 7 essential oils, which shows that it has all you should be looking for in a beard oil. As you can tell, all the ingredients are natural and 100% organic. Oils included in the mix are avocado, jojoba, sweet almond, virgin pumpkin seed, moringa, apricot, virgin argan, and kukui oil. The smell is recognizable and characteristic to the company – strong, yet very manly, something between clover and licorice smell. It absorbs quickly, making the beard softer and conditioned. After only a few uses, you will notice that your beard and skin have become healthier and that it is growing faster than before. Also, you won’t have to deal with beardruff anymore, and your facial hair will become tamed and neat, allowing you to style it easier in the desired way. If you usually have a lot of strays, after applying this oil, this will become the thing of the past. The powerful formula that contains minerals, vitamins and antioxidants will nourish your manly mane and relieve irritation that usually causes itchiness in the first stages of beard growth. 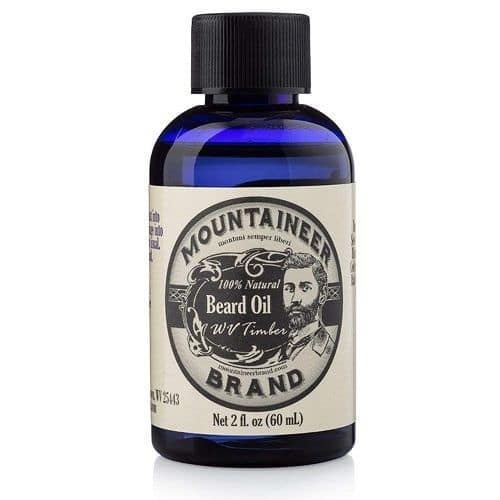 If you are searching for a product that can help you get rid off itching and flaking of your facial hair, you will want to look into Beard Oil by Mountaineer Brand. Being made with three carefully selected, premium quality oils and a few more natural essential oils, this item will hydrate your skin and eliminate all the possible problems associated with the dry skin under your beard. The primary ingredients are grapeseed, almond, castor, cedarwood, fir needle and eucalyptus leaf oils. However, cedarwood and fir needle are the dominant ingredients that give this oil its recognizable, unique scent – woodsy, but not overpowering. The scent is the strongest in the first few minutes, then mellows afterward. A few drops go a long way and providing that it comes in a 2 oz bottle, it will last you for a long time. It works fantastic in moisturizing the skin beneath your facial hair and softening your beard. With a few uses, your mane will become less frizzy and flake free. For the best results, apply it after showering because it works best on a damp beard. Unlike other oils, this one doesn’t have a dropper cap. The application is more like a shake a few drops into your hands, which doesn’t represent an issue because you will find this easy to do. Having in mind that a beard oil has to be powerful enough to make your facial hair soft and smooth, but not leave a greasy residue behind, Smooth Viking has created the oil with all natural ingredients. That’s why this lightweight oil is capable of taming and smoothing even the most unmanageable beards. Most times, facial hair is complicated to control and messy because it’s dry and damaged. However, by massaging only the little amount of this product into your beard, you will help it become stronger, healthier and beardruff free. For the best results, the manufacturer recommends combining it with a beard balm and conditioner. Inside the mix, some ingredients are known as the powerful facial hair softeners such as vitamin E, avocado, argan, sweet almond, olive, castor and pumpkin seed oils. Alongside them, there are essential oils that give the oil its pleasant, rustic smell. You will find grooming to be pretty easy after you apply it. Your beard will become moisturized, as well as your facial skin, while itchiness and dandruff will become the matter of the past. This oil absorbs quickly and penetrates into every single hair which helps in boosting your beard’s growth and strength, and allows you to tame it easier. Men with unruly, dull looking facial hair, who are dealing with itchiness, beardruff, irritation, and slow beard growth might want to take a look at Ranger Grooming Co. Beard Oil by Leven Rose. This item deals effectively with all of the listed beard problems and keeps your facial fuzz and skin moisturized the whole day. Interesting though, it is made with only two ingredients – jojoba and Moroccan argan oil, without fillers, fragrances, additives, parabens, and GMOs. In case you are wondering why it consists of two oils only, you should know that it’s because they soak in quickly and make your beard softer and tamed for easier maintenance. The product is stored in dark amber glass bottles that extend shelf life and protect it from UV rays and oxidation. You may also find it useful to know that it’s vegan-friendly and fragrance-free for a revitalized and strengthened beard. Apply it only after you’ve finished with styling your beard. Doing the opposite will make your beard greasier than it should be. You may find that this oil is a bit heavier, so make sure to apply only a small amount as it can go a long way. A glass stopper allows easier application. There are a lot of things that make Bossman Jelly Oil different than other oils in the market. First of all, it is the first oil for beards made from jelly. This gives it increased viscosity compared to more watery and thin consistency of other oils. Thanks to its structure, it provides full coverage, penetrates deep into the beard and doesn’t dry out quickly. If this is still not unique enough to you, maybe the fact that it comes in a bottle of 4 oz will. You know what this means – it will last you twice as long. You have a choice between three scents: magic, hammer, and gold, as the manufacturer calls them. The magic scent is made with sandalwood and vanilla oils, the hammer is made with geranium and lavender and has a mechanical smell, while the gold fragrance is created by mixing cedar, spruce, sandalwood, lemon, bergamot, lavender and saffron spice and it has a fresh scent. The list of ingredients includes soybean oil, beeswax, castor seed, sunflower seed and avocado oil, shea and cocoa seed butter and tocopherol. The benefits you get from this jelly oil are faster and thicker growing beard that is no longer dry and brittle. In addition, you will get rid of that annoying itchiness, beard dandruff, and irritation. If you want your beard to look amazing, the skin beneath has to be in excellent condition too. The Gentlemen’s Beard Oil takes care of both, so it doesn’t only soften the beard, it also moisturizes and conditions your face skin. This helps in reducing the itchiness, flakes, and irritation. All it takes are just a few drops, and you will almost instantly feel that your beard is more manageable and less coarse. Also, you won’t have to deal with split ends and stray whiskers. Because it is lightweight, this oil absorbs fast deep into your facial hair, making it stronger, and all that without leaving the greasy residue. 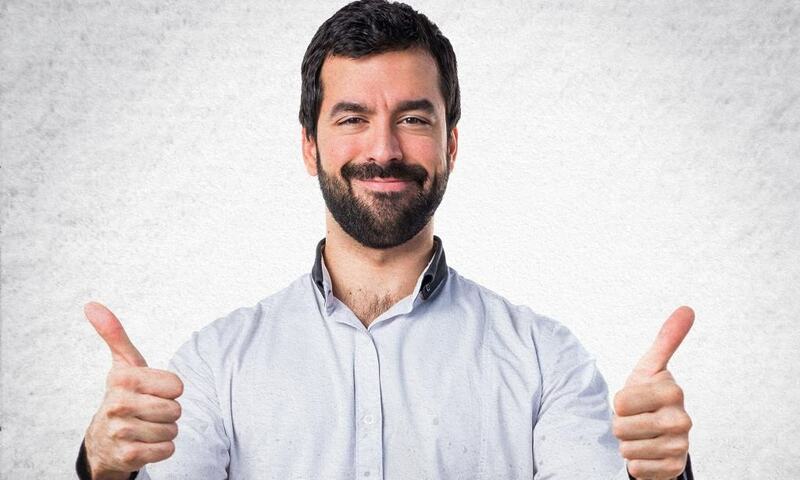 Another benefit you get is a fuller and thicker looking beard, and who can say no to that? Don’t worry about the application process, as this product has a glass dropper to make it more convenient. One reason why men often refuse to use an oil or don’t know which one to choose is the scent. However, with this little thing, you won’t have to worry about it. It is entirely fragrance-free, and you won’t smell anything even if you put your nose in the bottle. Plus, you can combine it with your favorite cologne. 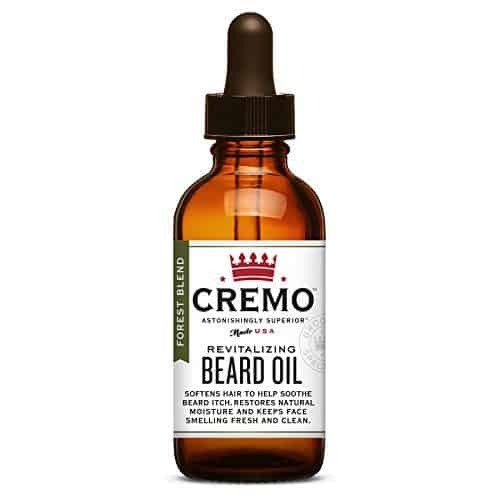 No matter the length of your facial hair, Cremo Revitalizing Beard Oil will help you in restoring your beard’s natural moisture, make it softer, reduce the itchiness and promote healthy growth. The biggest problem guys with shorter beards have is itchiness and irritation that come with new hairs sprouting from their face. On the other hand, men with longer beards struggle with the loss of moisture, which leads to flaking, damaged hairs, and irritation. So, no matter which of these groups you belong to or the beard problems you might have, this product will effectively solve them. It will prevent ingrown hairs on shorter beards, and replace natural moisture on long beards, while at the same time nourishing and hydrating dry, damaged strands and the skin underneath. The base of the formula are the high-quality ingredients such as argan and jojoba oil, along with other carefully selected ingredients and essential oils for a fresh and clean smell. While at it, there are three aromas to pick from: forest blend, mint blend and unscented. The manufacturer and some of the customers recommend the first one, because of its woodsy smell that it’s not too overpowering. It absorbs quickly, doesn’t feel heavy, and doesn’t leave the greasy residue. 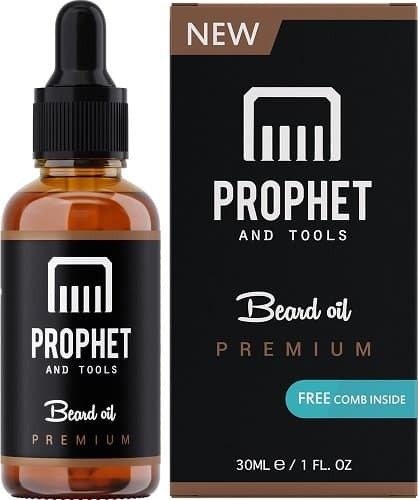 Suitable for the new beard growers, as well as the established beardsmen, Prophet and Tools comes with a convenient free beard comb and a beard care ebook guide. The oil itself is 100% organic, and unlike many other similar products it is vegan-friendly and does not contain nuts, so it will work well for men allergic to nuts too. Actually, it works great on black men and Asian beards equally well as it does on white men’s beards. When you start using it, you will notice less split ends, detangled hairs, healthier, thicker and faster growing facial hair, and skin free of irritation, burning, flakes and itchiness. Even the toughest and coarsest beard will become softer and moisturized. It’s not greasy and absorbs quickly. The comb you get in the package is convenient when you want to spread the oil evenly, and it fits perfectly in the pocket when you are on the go. Interesting fact about this tool is that it has handmade animal engraved so you can get either lion, bear, panther, gorilla or ox. You can’t choose the engraving, but that’s part of this item’s charm. The fact that you are a bearded man makes you exceptional among regular guys, but if you really want to look and feel like a true gentleman, Grave Before Shave’s Oil is what you should go for. What sets it apart from other products of its kind is its distinctive bourbon scent, and what man doesn’t like some bourbon? Don’t worry, you won’t smell like you are drenched in an actual bourbon. The smell of this oil is more like the mix of bourbon and sandalwood, muskier and cologne like. Men who have tried it say that it reminds them of a subtle vanilla scent. Tea tree, apricot, jojoba, sweet almond, vitamin E, and aloe vera, along with some essential oils, work together in profoundly conditioning and protecting your facial mane. As you can see, these are all completely natural ingredients that offer a lot of benefits to your beard and skin. No more itchy beard and dandruff that are driving your crazy. Instead, your facial hair will be moisturized, strengthened and much healthier. The beard cannot be healthy if your face skin is not. But worry not, as this product is designed to treat dry skin under your beard, preventing it from developing flakes. 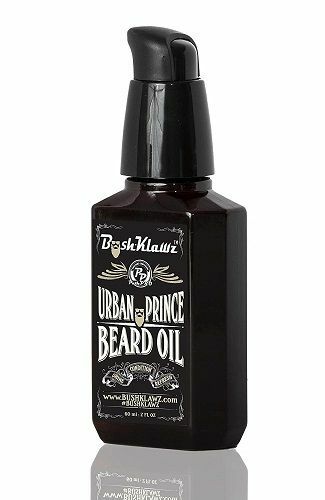 Not every day you see a bottle of beard oil that has a rectangular shape, and that’s the first thing that makes BushKlawz’s Oil stand out. Another distinctive feature is the pump dispenser. While most other manufacturers prefer to go with glass droppers, people from BushKlawz don’t think the same way. To use it, you should remove a small form-fitting black cap first. The cap itself looks just like the pump, and its purpose is to prevent you from accidentally pressing the pump, especially when you put the bottle together with other items during your travels. All the carrier oils used in the mix are of the premium quality so you will find jojoba, argan, grapeseed, olive, coconut, and aloe vera oil. They all work together in making your beard healthy, conditioned, fuller looking, beardruff free, softer and more manageable. While keeping your beard groomed and at its best, this oil hydrates and moisturizes the skin underneath, preserving its natural balance of oils and moisture. All beard types can benefit from the use of this item, and especially the ones that are dry, brittle and unruly. The fragrance represents a refreshing balance of cedar, grapefruit, spices, fir, and lavender. One thing that most manufacturers don’t pay a lot of attention to is the packaging. Sure, some oils’ come in a nice package, but none of them comes in a recyclable packaging like Simply Great Oil. Its bottle is made of recyclable amber glass, the label is also recycled, and it is printed with non-toxic, biodegradable wax inks. The product itself is extremely easy to use, thanks to a nifty ball rod cap. 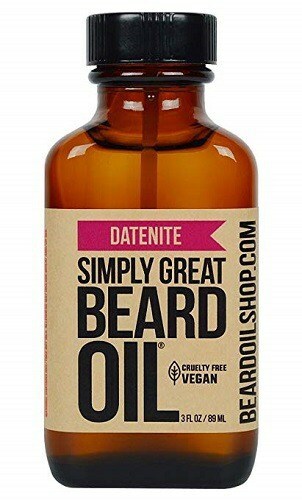 This allows you to take a little or a more considerable amount of oil, depending on the size of your beard. There are even 19 scents available, so there is something for every man’s taste. The Datenite scent itself is cool water inspired, and it has a crisp, clean and spicy aroma. Vegans will also want to look into this item, as it is made to be suitable for them too. As you can see, the brand made sure to make everything environment-friendly. It is only reasonable that all the ingredients are also entirely natural. The list includes olive, hazelnut, sweet almond, wheat germ, rosemary oil and vitamin E.
In the process of application, make sure to first shake the bottle to disperse the scent better into the oil. This product helps the most to wiry, rough and bristle beards. The result is a moisturized skin and facial hair that is free of dandruff, itchiness and is much softer at the touch. The bottle is 3 oz so it will last you for a long time. You can tell just from the thick consistency that Northern Fir’s Oil is a higher quality product. The formula is handcrafted, and it includes a distinct blend of nine of the finest plant-based oils, that are carefully selected because they are known for their unique contribution to your beard’s health. While most of the other oils use cheaper, refined versions of argan and jojoba oil, what really sets this oil apart is the use of 100% unrefined jojoba and argan oil. There are some other precious and rare ingredients included in the mix, such as the Australian sandalwood. In this product, there is a substantial amount of sandalwood which makes a huge difference in how the blend performs. All these natural ingredients are responsible for the fresh, woodsy scents with notes of cedar wood, black pepper, and juniper berry. At first, the smell is strong but dissipates in about 15 minutes. 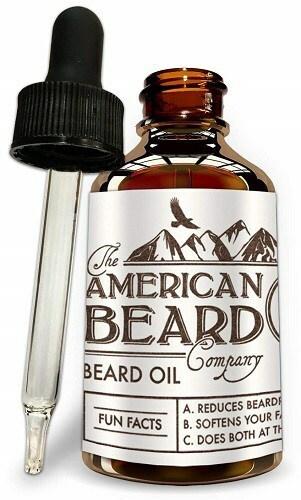 Although the bottle is only 1 oz, it will last you 1-2 months, depending on your beard’s length. The bottle itself is exquisite and practical amber, rectangular shaped glass bottle with a metal cap and reducer. You won’t have to deal with greasy residue, as your beard will absorb it relatively fast. It is very rare that a beard oil comes in a 4 oz bottle. However it’s not impossible, and Botanical Skin Works Oil is proof of that. You can say that it is the 3-in-1 formula, because it softens, cleans and moisturizes beard and skin at the same time. Its antibacterial and anti-inflammatory properties will strengthen your facial hair and give you deep nourishment, while at the same time rejuvenating your skin and keeping it healthy. Jojoba, sesame, organic lime oil, West Indian bay, and sandalwood are five essential oils you will find in the blend, each of them carrying the unique benefits. For example, jojoba is an excellent moisturizer that will quickly absorb into your beard and make it more manageable. Sesame oil will stimulate facial hair’s growth, while the West Indian bay is great for treating beard itch and dandruff. Other three ingredients will help you tame unruly hairs, and keep your beard soft, smooth, and well groomed. The design of the bottle is also fairly nice. In addition, the bottle has a fantastic pump that works pretty good. It will pump just the perfect amount so you won’t be able to overdo it when applying the oil. 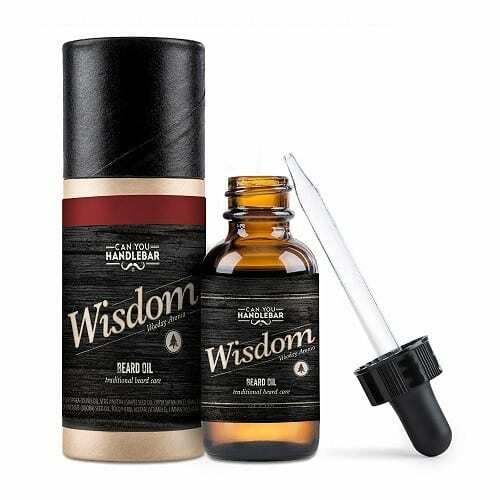 Wisdom scent of Can You Handlebar is just one of seven available fragrances from this manufacturer. The smell reminds of fresh-cut lumber, something between spruce, cedar, and lemon. Consumers who have been using it so far, insist that it’s masculine but not overpowering. This product can also be used as a substitute for any other softener and leave-in conditioner because it conditions and tames wild and dry beard and also prevents split ends. 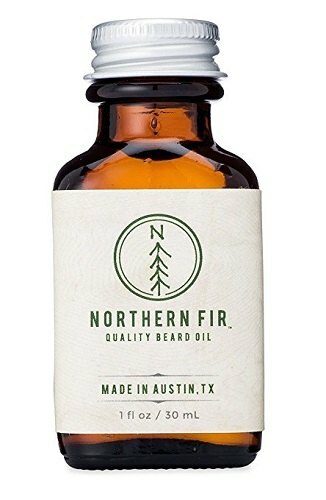 All the ingredients are natural, high-quality, safe and nut free, and are designed to hydrate the beard hairs and skin, reducing itchiness, dryness, and flaking. For easy application, each bottle has a dropper-top and is packed in a signature no break storage tube. This will keep the amber glass bottle safe from breaking in case you accidentally drop it. Not that it can break easily because the glass is extremely durable. The labels are oil and waterproof so they will keep looking amazing and elegant for a long time. While talking about the label, it is worthwhile mentioning that you will find the list of all the ingredients there. Rest assured that all of them are completely natural. 16. Wild Willies Beard Co. If you are up for trying an award-winning original oil for beards, then you should try Wild Willies Beard Co. Oil. The tagline of the brand is: Fuel your beard, and once you apply this product to your facial mane, your beard will be indeed fuelled, meaning it will enhance and boost its growth. This happens due to this product’s potent, specialized blend of all natural ingredients, 10 key vitamins and essential oils that treat and condition each follicle down to its roots. The oil itself works by conditioning your beard from the inside out, which stimulates growth and strengthens your facial hair. It also inhibits irritating beard itch and dandruff. The first thing you are going to notice is that it doesn’t leave your beard or skin oily or greasy at all. One of the most valuable features is the unique, easy-to-use pump top that is designed to enable minimum product usage with maximum results. Thanks to this pump, you will have a complete control over how much oil you get, and you will be able to prevent spillage and wasting of your oil that often occurs when the product has a different top. You have a choice whether you will purchase only one bottle of 2 oz or 2 bottles of 2 oz to ensure that it lasts you for much longer. 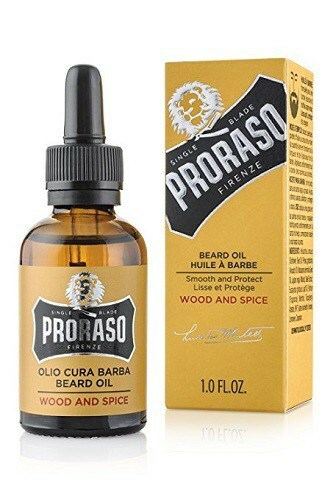 Originating from Italy, Proraso Beard Oil is primarily meant to be used for nourishing and protecting a long and thick beard. However, this doesn’t mean you shouldn’t use it if you have a shorter facial hair. On the contrary, you will still experience all the benefits it has to offer. This oil penetrates deeply into the hairs to tame, smooth, soften and moisturize your facial hair. The result is a beard that is soft as silk, without any greasy residue. Exclusive wood and spice scent come from the perfect mix of cedar, rock rose, spicy cumin, saffron, and vanilla. Remember that a little goes a long way, so use it sparingly. When appropriately applied, the fragrance is mild and balanced but not overpowering. With 97% of natural ingredients, this item doesn’t contain any parabens, phthalates, silicones, mineral oils or SLS. In fact, it is infused with menthol, eucalyptus, avocado and sunflower seed oil. Among the ingredients, there are also walnut and macadamia nut oils that provide extra protection to the hairs. The bottle has a dropper top that allows you to be completely in control. Another award-winning oil, Port Products Conditioning Beard Absolute is known for effectively fighting two of the significant concerns that beardsmen have – unruly hairs and dry skin. Just to state the obvious, the ingredients are the main culprits for these benefits. Grapeseed oil softens and smooths the hairs while moisturizing the skin underneath. Argan oil will unclog your pores and eliminate flakes. This will help restore a healthy balance to the unruly beard hairs you might be experiencing. For the subtle woodsy scent, there are Australian sandalwood and bergamot essential oils. The good thing is that the smell is strong at first, but then it fades over time. Don’t get fooled when you apply it for the first time. It will look oily, but it will get absorbed really quickly and dissipate before you know it. Only a few uses are enough to eliminate the annoying beard dandruff forever. The best of all is that you won’t need more than 4-5 drops even for the long beards. The benefits don’t stop there. The foundation of a great looking beard is a smooth and moisturized skin, and this product does wonders to the skin below beard. For instance, it will keep it smooth and soft, with zero annoying shine. The top is a glass dropper, so the application is very simple, as you can guess. Designed for all beard types and textures, no matter the ethnicity, The American Beard Company product is 100% organic and does wonders for rough, unruly and untamed beards. The difference is noticeable after only one use. If used correctly, it will strengthen, condition and soften your beard, and also speed up the growth process. Beardruff and itchiness will be drastically reduced, and you will be left with a moisturized and much healthier facial hair. This oil is multifunctional, and grooming is not the only thing you should use it for. It can also help you in maintaining, shaping and styling your beard. You can even use it as a thickener or straightener. If you’re a vegan, don’t worry, you can use this product because it is vegan approved and not tested on animals. Furthermore, it is very efficient, and it doesn’t require more than one to two drops per application. The item is suitable for men with sensitive skin, and won’t cause any hairs falling off or breaking. The best thing for the end – this oil is completely fragrance-free. You know what this means – you can freely combine it with your favorite cologne. Or not. The choice is up to you. 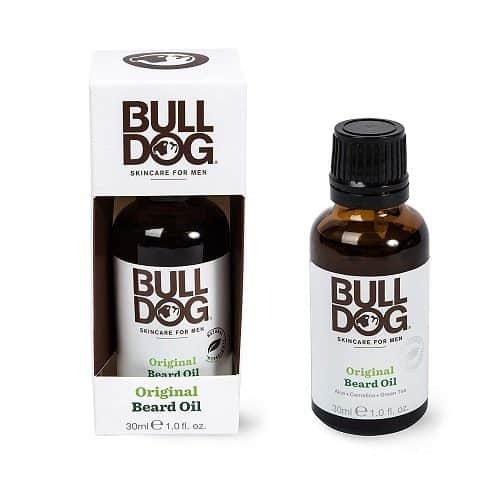 From conditioning and moisturizing to taming and softening, Bulldog’s Beard Oil is exceptional in taking care of any facial hair type. It works particularly good in maintaining a coarse and brittle beard. For extraordinary performance, the blend includes ingredients such as aloe vera, camelina oil, and green tea. If you look at its properties, it reminds you more of a leave-in conditioner, and the consistency is similar to the one lotion has. These features help in taming stray hairs and in addition provide styling abilities. Because it doesn’t make your beard look greasy, you can say that it has a matte finish. When applying this oil for the first time, you will notice that it looks wet on your facial hair. This is nothing to worry about because once it dries, your beard will look healthier and thicker. Put a little amount, rub it between hands, and massage into the beard, especially on the areas that need to be styled and tamed. To make sure that it’s evenly distributed, give your facial hair a good combing. The product will never irritate your skin, as it works amazingly well on sensitive skin. 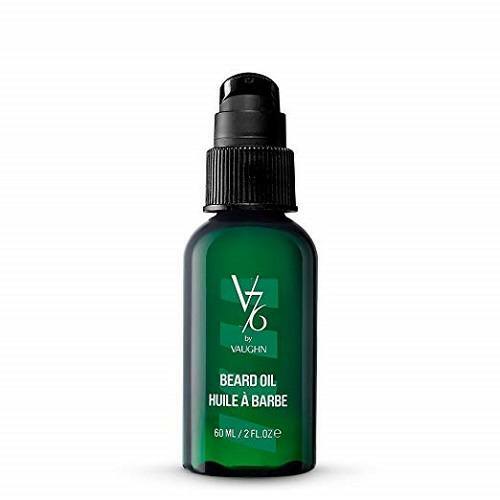 Not many times you will run into entirely vegan formula beard oil, but V76 by Vaughn is exactly like that. Things like parabens, sulfates, mineral oil, petroleum, and gluten cannot be found in this product, not even in traces. Central ingredients are saw palmetto and safflower oil, each with its unique benefits. Saw palmetto soothes the skin and beard and makes them healthier. Safflower oil efficiently deals with dry skin and rough facial hair, while also conditions, hydrates and makes it softer than it was ever before. When weighing which oil to purchase, it is essential to determine if it’s comedogenic or not. In other words, this means you should check to make sure it won’t clog your skin pores and cause acne. With this product, however, you can be sure that it won’t cause you problems of this kind. It is quickly absorbed, thicker than most oils and moisture lasts way longer than usual. The fragrance is blue cedar, which is actually a magnetic woody scent. Coconut milk, nutmeg, violet, peach, blue cedar tree, moss, leather accord create this unique smell. Tea three is not the only scent of beard oil that Beardbrand has to offer, but as the manufacturer likes to say it, it is the crispest, clean and fresh-smelling. The formula is crafted from only the finest natural blend of oils, after months of research. Unlike some other oils, this one is designed to be very lightweight. It will keep your beard conditioned, without weighing it down or feeling and looking greasy. The only thing that you are left with is the intoxicating fragrance. Due to the viscosity of the oil, you really have to give the bottle a firm shake to get the product out. 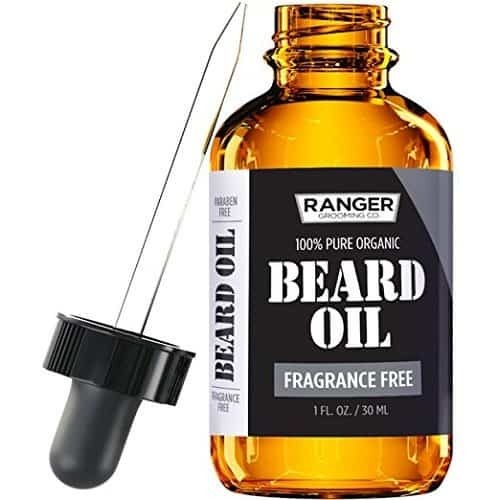 The manufacturer recommends shaking no more than 3-4 drops of oil into your hand and massaging them thoroughly into your facial hair and skin. In case you are used to using oils with a dropper-top, know that you won’t find it on this one. Instead, it has a little hole through which you shake the oil. Don’t let the lack of a dropper concern you because it is very easy to control the amount it gets out through the hole. Most customers usually have the issue with the price, but you can say that the quality, premium ingredients justify that. 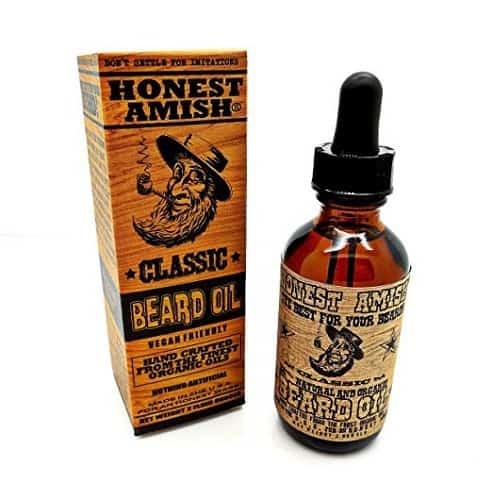 Just like in the classic oil mix, Honest Amish Premium is made of all natural and organic ingredients. On other fronts, these two oils have some differences. The premium version has a higher viscosity than the classic one. This means that you will need much less oil to achieve the same results. The result is a beard that feels less greasy throughout the day. Of course, the scents are distinctive too. The premium oil has a sweet peppery, woodsy scent that comes from virgin oils and Texas cedarwood and vanilla essential oils. It’s not too strong, and it will disperse after only a few minutes, but a sweet, subtle smell will follow you through the day. There will be no greasy and wet feeling, only a slightly oily one that will absorb reasonably quickly. More than 10 premium ingredients work in boosting your beard’s growth and making it healthier and softer, while also relieving any irritation of new hairs growth and itchiness. The bottle is a frosted clear glass, and the substance itself is more orange compared to the classic version which is more brownish. Choosing quality over quantity is imperative when it comes to beard oil, and this is exactly what Beardoholic achieved with the light cedar fragrance oil. To ensure that the quality is preserved, this product is stored in dark amber glass bottles, known to extend shelf life and protect them from UV light rays and oxidation, as oils are light sensitive. While at the quality, this product is made with 100% pure natural ingredients. In the mix are included only the best from the best premium oils, such as argan, jojoba, almond, castor, wheat germ, grape seed, essential oil and light cedar fragrance oil. Benefits of such crafted formula are numerous. First and foremost, it will help you stop a beard itch and completely eliminate beardruff, while moisturizing dry skin underneath. The texture of your new beard will be enhanced, and it will stimulate new hairs growth. After using this item for some time, your facial hair will become much stronger and healthier. Men with all beard types and textures can use it safely because it doesn’t contain any additives or GMO’s, and is paraben free. Just a few drops will keep your facial hair neat, smooth and tangle free while smelling pleasant and refreshing the whole day. Combination of organic jojoba, Moroccan argan oil and vitamin E in ArtNatural’s Beard and Stache Oil condition and soften your facial hair, allowing easier and better grooming than ever before. This healing, hydrating formula works remarkably great in eliminating itching, flaking, inflammation, and acne. One of the ingredients, vitamin E to be precise, has antibacterial and antioxidant powers that work admirably well for deep cleaning pores and beard growth stimulation. Blending it with Morrocan argan oil means having a winning combination that will condition your beard from the roots and ensure healthier growth. One thing you won’t have after applying this oil into your beard and skin are bald spots and split ends, as they become the matter of past. The product works similarly as a leave-in conditioner so you won’t have to rinse it before styling your beard. The formula is carefully crafted to be gentle to every skin type, and you can safely use it even if your skin is very sensitive. If the scent is what’s concerning you, don’t worry. This oil is completely unscented and comes in the amber glass bottle, which protects it from harmful UV rays that can cause oxidation. Finding the best beard oil is an important task and one that is well worth it in the end. You’ll be able to enjoy a luscious mane that is easy to groom, soft to the touch, healthy, shiny, full, and so much more. Once you find the best beard oil, say goodbye to itchy facial hair and beardruff and hello to everything that made you decide to grow out your facial hair in the first place. Now that you’ve had one of the market’s best beard care products explained it’s time to put that in use and get yourself a treat. Photo from: dzohny / depositphotos.com, luismolinero / depositphotos.com, 13-Smile / depositphotos.com, IngaDudkina /depositphotos.com, dima_sidelnikov / depositphotos.com.